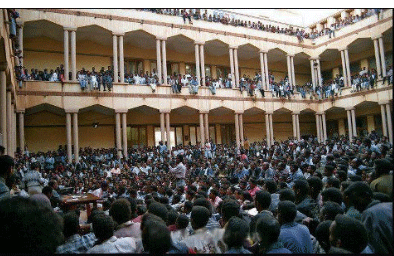 Why Demolishing the Sole University in Eritrea? An Entire Generation Denied Higher Education? Are we going to stay silent? Dr. Wolde-Ab Yisak conducts seminar in Washington D.C.
Why such a torture and ill treatment for someone who asks his/her right? Prof. Muse Lecturing Sociology of Change and Liberation at the University of Asmara for the 4th year students. The University of Asmara was founded in 1950's by the Italian government, Catholic Mission and the Ethiopian Negus. It has has been closed recently by the government of Eritrea. This video is dedicated to all students who graduated from one of the oldest African university . I am appealing to the government of Eritrea for the re opening of this prestigious center of higher studies. Today the governemnt has opened many collages in different parts of the country. Eritrea is the only country in africa with out a national univeristy, but was the 1st to have one even before the independant of many African countries. We demand your excuse for the bad audio quality, since it was filmed with difficulty and amateur camera. You can give your support by writing to the President of Eritrea and to the ministry of Education for the reopening of the university for the younger generation to come.
" If you want to kill a country kill its Educational system!"